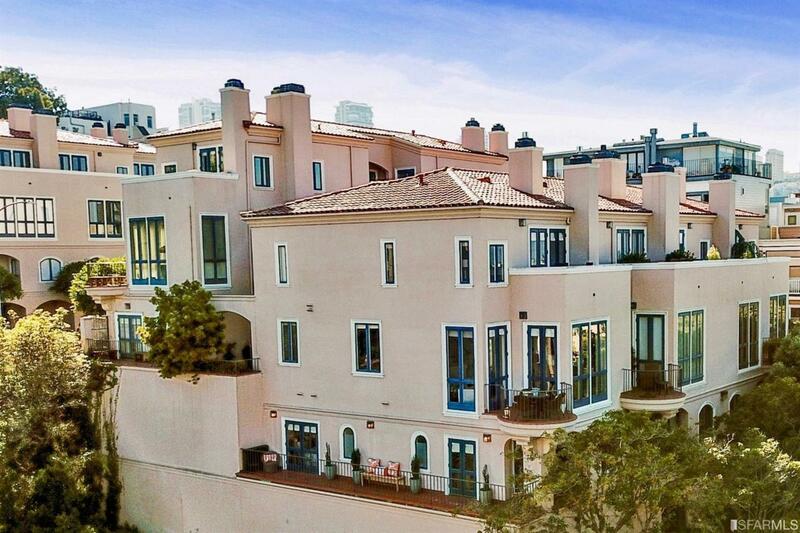 Enjoy commanding panoramic views f/ Golden Gate to Bay Bridge in this Telegraph Terrace NE corner house-like condominium. 5 outdoor spaces, abundant natural lt, neutral finishes, hardwood flrs. Elegant LR, open to DR, w/ 11' ceilings, Calacatta marble FP, curved terrace. Gas kitchen w/ grey quartz counters+white subway tiles, opens to patio. Powder rm main level. Graceful staircase leads to tranquil top level master suite opens to north terrace w/ spectacular B2B views, FP, generous closets & bath w/ dual sinks. Lower level 2 BR suites, laundry, direct access to garage w/ 2 sbs spaces. In the visually exciting Telegraph Hill neighborhood, ideally located nr financial district & waterfront's vast range of activities. This condominium is also offered for sale for $3.495MM.